As part of RadhaSapthami (Surya Jayanthi) festival in Tiruchanoor, Goddess Sri Padmavathi Amma Varu is taken out in a procession to four Maada Streets in seven different vahanams. All these Seven Vahanams procession took place before Sunset. 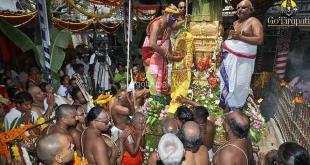 Those seven vahanams are namely, Ashwa Vahanam, Chandra prabha vahanam, Garuda Vahanam, Hanumantha Vahanam and Simha vahanam’s procession held at Tiruchanoor Sri Padmavathi Amma Vari Temple on the day of Rathasapthami ( Surya Jayanthi). 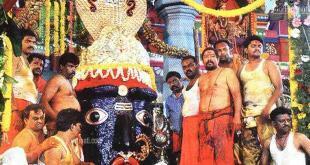 Tiruchanoor four maada streets is filled with Devotees who rush to watch Vahanams, as it is auspicious day. The direct bus is available from tirupati bus station to tiruchanur. 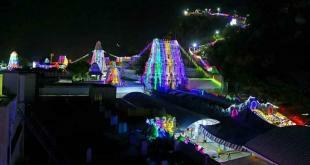 It takes 15 mins from Tirupati bus station. Crowd will be high during this time. Darshan might be around 1 hour.